Hello my friends! What a glorious week this has been. It’s our last week of summer and we have been savoring every second of it. We homeschool at our house and so when it’s back to school time, it’s back to school time for ALL of us. In fact, my kids have been asking for a few weeks now if they can start school already. Most of their friends have already started, seminary has started and they’re like, “what do I do now?” And I love, love, love that they want to start school. I love that they love school but I also love, love, love summer and my break and being able to work more so I look at them and smile and then tell them ever so sweetly, “Oh honey, I love that you’re ready to start school…but it’s a no.” They totally CAN open a book, read, make a project and do all that fun stuff on their own but this Momma isn’t ready to organize and lead any of that just yet. We do have an amazing school year planned and I’m excited for that so it’s going to be great but I am relishing in the last bit of summer that we have left. Alright, let’s dive in today! I’m bringing you something that everyone can relate to. Everyone. Teen, parent, adult, kid, everyone. If you’ve ever said or thought the words, “I can’t, I have to…” then this is for you. We say and think this quite a bit. When you think about something you really, really, really want why don’t you already have it? You’re probably going to say something like, “I can’t. I have to…” A couple of years ago I was talking to a lady and she was complaining about her work. She had recently gone through a divorce and still had three kids at home. She worked a job that required several hours a week and odd hours too. This job was far away so not only was the schedule demanding but the commute wasn’t a picnic either. She told me she really wanted to be home with her kids more. She really wanted to look for another job, one that would pay more with better benefits but also allow her to be home in the evenings so she could spend more time with her family. I asked her what she was doing about it. What jobs had she looked into already, what was her plan, etc. She looked at me like I had just said something highly offensive and replied, “Well, I CAN’T look for another job. I HAVE to work here at this job.” And then she proceeded to tell me that she couldn’t possibly look for more work because she had no time. By the time she got home all businesses were closed so she HAD to stay at this job. She felt stuck because any thought of getting unstuck was met with, “but you CAN’T…you HAVE to…” type of thinking. So I asked her, “why CAN’T you look for work?” Again, she looked at me like I was crazy and said, “My hours don’t allow for it.” And again started in on her story. She was frustrated with me and confused why I wasn’t understanding her story. But that’s what I was showing her, that it was just a story. She wasn’t stuck. We’re never stuck. We all have our agency. We never HAVE to do anything. But we CHOOSE to do things because we don’t want the consequences of choosing something different. In her mind she was so committed to her story that she wasn’t open to the option that there might be another possibility. I asked her about the many online options. There’s specific app’s that you can download and scroll through at any hour. You could look for work at 3:00am if you wanted to. There are many ways to get what you want but you have to first acknowledge that your story is just that…a story and if it’s just a story, who is the author? You, of course. Then who can change and rewrite the story? You, course. There’s always other options and thousands of possibilities out there but we block the existence of them by holding our own story so close to our faces that we can’t see anything other than our current situation. I HAVE to finish this assignment. I HAVE to feed my kids. I HAVE to pay my bills. I HAVE to do my chores. I HAVE to go to this service project. *How does it feel to HAVE to do something? Think about it, where do you feel this in your body? Do you tense up? Something heavy in your stomach maybe? If you had to name a one work emotion in this moment, what would it be? How are you feeling in that moment? Resentment? Stuck? Defeated? Resistance? I don’t know about you but I don’t like being told that I HAVE to do something. I don’t even like telling myself that I HAVE to do something. Because the truth of it is this, you don’t HAVE to do anything. As human beings endowed with agency, we don’t HAVE to do anything. We have choices. There are always options. With that woman and her job. She believed her story so much that she truly did think she HAD to stay there. When I asked her if there was someone physically going to her home, dragging her out of bed, and physically forcing her into the office, she of course said, no! So I said, okay, so you CHOSE to get up, get dressed, and drive to work. “Well, yes.” I asked again, “Is there someone at work that chains you to your desk? That makes it so you absolutely cannot leave at any moment?” She’d say, “Well…no, of course not!” The more and more I’d question her, the more she’d start to realize that she didn’t HAVE to stay but that she was CHOOSING to stay. So then the important question: WHY are you staying? She was staying because she WANTED the paycheck. She WANTED that money she’d earned so she could pay her bills, so she could keep her house, so she could buy food, and gas for her car, and clothes for her kids. And once she started seeing that she was using her agency because of things she WANTED instead of things she HAD to do she was then and only then open to entertaining other options and other job possibilities as well. The first step though is to realize and recognize that we’re just telling ourselves a story. I HAVE to go to school. Do you? Do you HAVE to go to school? No, of course not. No one is physically dragging you there. Or I don’t know maybe your Mom is but she’s not forcing you to stay, chaining you to your desk. So if that’s not the case, ask yourself WHY you’re going to school. Because you want an education, you want to graduate, you want to get into college or be able to get a good job someday right? You don’t HAVE to go. There are laws actually that state that minors DO HAVE to attend school or you get visited by the truancy officer and maybe there’s your why. I WANT to go to school so I don’t face the consequences of the law. But remember always that you DO have a choice. It is YOUR choice to go to school because you WANT what school has to offer. Same thing with working and paying bills. A lot of my clients tell me they CAN’T go on that dreamy vacation they’ve always wanted to and that thought makes them feel sad. I ask them WHY can’t they go? They can’t go because they HAVE to pay their bills, there’s no money for their trip. But really, there IS money. They don’t HAVE to pay their bills. They could use that money and go on that fancy trip tomorrow if they really wanted to. But they don’t want to do that because they WANT to stay in their home. They WANT to have running water and power in their house. It’s important for us to realize and acknowledge that we always have choices. That we never HAVE to do anything but we WANT to do it. We discount those WANT to’s so often like they’re a given. I can’t go hang out with you today, I HAVE to do my chores. But you don’t HAVE to do your chores, you’re choosing to do your chores because you don’t want the consequences that will follow if you don’t do them. There’s always a WANT in there. Let me ask you this, how do you feel when you WANT to do something? What changes for you? I know for me it takes the resistance out of it. I’m no longer arguing with it. I’m not defensive towards it anymore or complaining because I’m stuck. Because I know that Im not stuck, that at any moment I COULD decide to do something else. I’m no longer in resentment because I HAVE to do something. It’s MY choice, I feel motivated by purpose instead of feeling chained because of a story that I’ve told myself. You ARE the author of your story. What story are you telling yourself? Why are you telling yourself that you HAVE to do something? We don’t show up as our best selves when we feel stuck, chained, or imprisoned to something. It’s contrary to Heavenly Father’s Plan. His plan allowed agency, one of His greatest gifts to us, that ability to CHOOSE what we want to do and how we want to feel. As soon as you can make that shift from HAVING to, to WANTING to there’s a huge change that happens inside you. After you’ve realized that it’s just a THOUGHT you’re hanging onto, a thought that only YOU can change, you begin to feel something different. It’s important to remember that you are in control of how you feel always. YOU CREATE YOUR FEELINGS BY YOUR THOUGHTS. If you’re feeling resentful because you HAVE to do your chores, because you HAVE to feed your kids, because you HAVE to go to work. It’s because of those exact thoughts. The circumstance for chores is: Mom asked me to clean the kitchen. Now the key to it all: If you think, I HAVE to clean the kitchen. I can’t go hang out with my friends. If you thought instead, I WANT to clean the kitchen so I can hang out with my friends. The feeling shifts to motivation instead of resentment. There’s purpose to what you’re doing and more importantly you’ve found your reason for WANTING to do something. In which scenario do you think you’re showing up as your best self? The one where you’re resentful and lagging? Or the one where you have purpose and feel motivated? No brainer, right? I want to remind you all of last week’s episode on opposition in all things. Just because I change my mindset from HAVING to do something to WANTING to do something doesn’t mean that I all the sudden love whatever it is that I’m wanting to do. There are many times that I want to do something that doesn’t feel good. I want to pause for a moment and say this – We don’t ever do things because we think getting the result will change how we feel. Like my clean house isn’t going to make me feel good. What’s going to make me feel good is having thoughts that create those positive feelings that motivate me into action, that then create the results I want. It’s very important to separate the thoughts of: Results create how I feel vs my thoughts create how I feel and then I achieve the results I want because of how I felt. I need to think believable thoughts that create the feeling of WANT, of motivation, of purpose for me to go and do and create the results I want. If I try and pretend and think thoughts like, “yay, I love cleaning! I don’t have to, I want to.” I’m not going to believe it and I’m still going to feel resentful and negative about it. So make sure that you find your WHY, your purpose for why you would WANT to do something and not feel like you HAVE to do something – because that’s a false statement. There are a lot of times that I’m willing do something that I don’t like because I want the overall everything. I’m willing to experience the opposition so that I can appreciate the positive of it. With school, I knew that I would have lots of homework and assignments that I wouldn’t love but I was willing to experience that because I wanted to learn, to grow, to graduate. Know ahead of time there’s going to be opposition so then you just expect it, it’s not a problem and focus on your WANTS instead of all the HAVE to’s. I WANT to have four kids. I didn’t HAVE to have four kids. I knew ahead of time, especially by the fourth that there was going to be sleepless nights, potty training, mess, and lots of noise and I still chose all of it because I WANTED to have my kids. I love my kids. I embrace, accept, and still choose all of it day after day. Tony Robbins once said, “Where your focus goes, energy flows” – the same it true here. If you’re focusing on all the reasons why you think you HAVE to do something you’re going to find lots of evidence of why it’s not “fair” or “fun”. If instead you focus on all the reasons why you WANT to do it, then your brain will go to work finding lots of reasons why it’s positive, and good, and will motivate you to keep on keeping on. Where are you directing your focus? Where is your energy going? It’s okay not to love everything about life or to not be happy all the time. We’re not supposed to be. But you CAN switch from HAVING to to WANTING to at any time which makes the journey so much richer and meaningful. HAVE TO is part of the adversary’s plan. It’s his tactic. Heavenly Father offered us choice, our agency, and the Savior made the ultimate sacrifice so that we could come here and learn, make mistakes, experience all that life has to offer – the full spectrum of emotions, and the beautiful blessing of starting fresh and clean again and again. He wants you to choose. He wants you to exercise your agency. He wants you to come up with your own WHY, your own reason and purpose for what you’re doing. He wants you to choose what you’re going to focus and expend your energy on, the things you don’t like? The injustices? Or are you going to find your why. Why do you want it in the first place? It’s not, I don’t like taking the trash out and I don’t want to take the trash out. It’s cold outside. The trash stinks. Why do I always have to be the one to do this?! OR…it can be, I don’t want my mother doing this. I want the trash gone. Isn’t it nice to have waste management? That all I need to do is bring it to the street and someone else takes it away? I don’t have to load it in my car and drive it somewhere? This is a small thing I can do to help the family. I want to contribute. I want to help. When you question your story of HAVING to and start asking different questions of why I possibly WANT to your eyes open to see a world of possibilities and options. It’s a beautiful place to be, my friends. 1.) You never HAVE to do anything. You have agency. What story are you telling yourself? 2.) Remember your thoughts create your feelings so if you’re feeling resentful, time to check your thoughts and question your story. 3.) WHY is a powerful word. Why are you doing what you’re doing? Never because you HAVE to but there’s another reason there of why you’re wanting to. Get to this place. You’ll feel so much better. 4.) It’s okay not to enjoy everything you’re doing or experiencing. You can still WANT something and not enjoy it. I want a clean house but I don’t enjoy cleaning everything and that’s okay because I have a bigger WHY, a bigger purpose for doing it and I’m willing to experience this opposition so that I can create what it is that I want. 6.) Lastly, HAVE to is the adversary’s tactic not the Savior’s. The Savior extends a hand in choice. It’s up to you what you decide to do with your agency. Okay, I hope you have an amazing week. No more HAVING to do anything but finding out why you WANT to be doing them. Fun stuff! OH!!! Today is the end of the giveaway! THANK YOU to all those that participated in this and left reviews. I just love you for taking the time to do that! 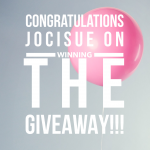 If you haven’t, I’d still very much appreciate a review but today’s winner of the giveaway is…Jocisue! So, … email me at www.thecatalystcoaching.com that’s CATALYST COACHING .com and I’ll get these fun goodies over to you!